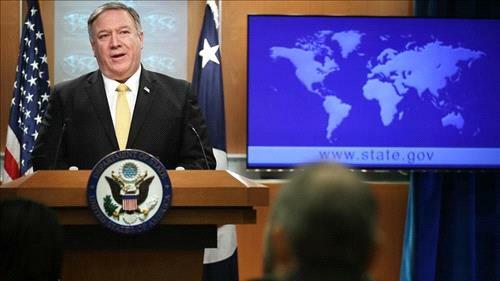 AMMONNEWS - The United States is suspending its compliance with the Intermediate-range Nuclear Forces Treaty with Russia on Saturday and will withdraw from the landmark 1987 arms control accord in six months if Moscow does not end its alleged violation of the pact, US Secretary of State Mike Pompeo said on Friday. Russia denies violating the treaty, which bans either side from stationing short- and intermediate-range, land-based missiles in Europe, according to Reuters. The American withdrawal, which has been expected for months, would follow years of unresolved dispute over Russian compliance with the pact, known as the Intermediate-Range Nuclear Forces, or INF, treaty. The treaty, signed in 1987, has been a centerpiece of superpower arms control since the Cold War. Some analysts worry its demise could fuel a new arms race. Trump said that on Saturday, the US will “suspend its obligations” under the treaty, meaning it will be freed from its constraints, including the testing and deployment of missiles banned by the pact. Pompeo said in early December that Washington would give Moscow 60 days to return to compliance before it gave formal notice of withdrawal, with actual withdrawal taking place six months later. The 60-day deadline expires on Saturday. Technically, a US withdrawal would take effect six months after this week’s notification, leaving a small window for saving the treaty. However, in talks this week in Beijing, the US and Russia reported no breakthrough in their dispute, according to The Associated Press. NATO said on Friday it fully supported the US decision to pull out from a Cold War missile treaty with Russia, saying Moscow was in breach of the agreement. “The United States is taking this action in response to the significant risks to Euro-Atlantic security posed by Russia’s covert testing, production, and fielding of 9M729 ground-launched cruise missile systems. Allies fully support this action,” the transatlantic alliance said in a statement. Eralier on Friday, Russia said it regretted Washington’s expected exit from treaty and expected to receive formal notice from the United States shortly. “We all regret that in the coming days this decision will most likely be implemented,” Kremlin spokesman Dmitry Peskov told journalists. Russia and the US have over the past months held discussions to rescue the Intermediate-Range Nuclear Forces treaty (INF) but say efforts have led nowhere. Also the European Union foreign ministers raised concerns earlier on Friday about the spread of nuclear weapons as the United States readied to pull out of the treaty, blaming Russia for violating it. The Pentagon has shared information with NATO allies asserting that Russia’s new 9M729 missile system falls within the treaty. It believes the ground-fired cruise missile could give Moscow the ability to launch a nuclear strike in Europe with little or no notice. Moscow insists the missile has a range of less than 500 kilometers. Ministers from the Baltic countries close to Russia’s borders - Lithuania, Latvia and Estonia - were mostly in support of the US move and clearly blame Russia.